Risk of Rain 2 is in Early Access, meaning players who jumped into the latest Hopoo Games release are being treated to frequent patches and updates. The newest update landed on April 3, 2019, and is officially labeled as Early Access Patch Build ID #3703355. Read on to discover all of the changes and tweaks offered in the patch notes for newest April 2019 Risk of Rain 2 patch. 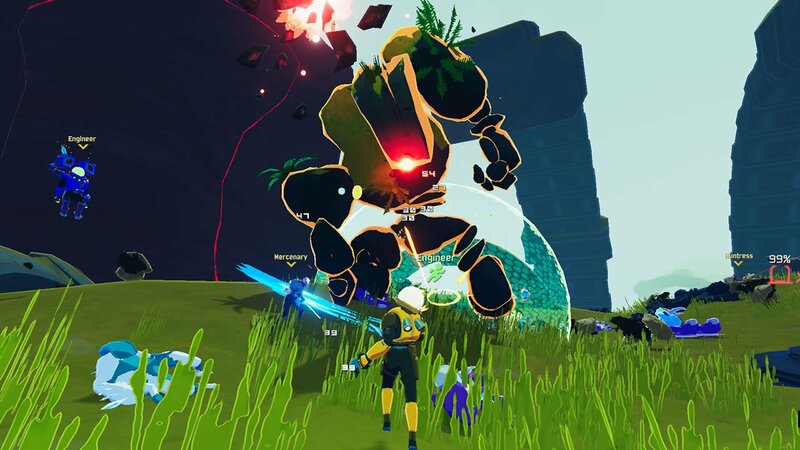 The new Risk of Rain 2 update for April 3 is primarily focused toward balance changes and performance adjustments for the latest build number #3703355. It offers adjustments to Prismatic Trials, MUL-T, the Teleporter, and the Imp Overlord. In the case of the latter, the boss' passive regen has been removed, but its damage base damage has been increase from 13 and 16. The update offers several additional bug fixes as well. Find the full update #3703355 patch notes os offered through the official Risk of Rain 2 Steam store page below. Increase Transport Mode speed boost from 200% to 220% to compensate for his lost base movement speed. We really really don't like to nerf characters in general - these are very light touches, and the movement speed being higher was an oversight. We also want to make sure that MUL-T's big success isn't coming from its ability to abuse Ocular HUD for infinite crits. The boss fight was a big of a slog if you had lower DPS because of the boss' natural regen. Higher damage should make the boss fight more intense. Increase teleporter passive particle radius from 38 to 60. Increase particle count so density remains the same. A lot of players are having issues finding the Teleporter. Players are starting to notice the passive particles indicating the teleporter is around - we will try increasing the radius to see if it helps. The rim glow will help distinguish it from identically colored surfaces. This is intended to be a fairly big change - if it turns out we jumped the gun and the community was simply learning, we can approach a middle ground. Corrupted save files no longer prevent the game from initializing past the first splash screen. We will continue to figure out why exactly they are being corrupted in the first place. Refactor Multiplayer connection setup to be more stable - hopefully less weird half-states on connecting to other players. Selecting the "Quit to Menu" pause menu option from the Prismatic trials no longer temporarily shows the main menu. Engineering Perfection challenge can no longer be completed by starting 30 levels without finishing them. Environment logs now count towards the 10 logs challenge. Equipment - Royal Capacitor now requires line of sight to use. When playing with a controller, pressing the confirm button at the main menu will no longer choose the last option that was hovered onto. Revert button text now properly becomes highlighted when functional. The Mercenary is now properly targeted by enemies after he uses a non-primary skill. Multiplayer: Characters no longer come back to life after dying in a multiplayer game, leaving it and joining it back. Monster Tooth: The Monster Tooth healing orbs heal amount now match the description. Multiplayer: Acquired Items now properly show up in the Item bar or the Info Screen after leaving a multiplayer game and joining it back. The Enter Quickplay button of the Multiplayer Menu no longer needs to be pressed twice to start searching a lobby when using a controller. Holding the Primary Skill Button down while activating Ocular HUD and shooting with Mul-T Auto-Nailgun no longer deals infinite critical damage. Falloff models for delayed blast attacks (Titan Fist, Ice Affix Death, Willowisp) are now properly assigned. This may cause them to do more damage than before. The Risk of Rain 2 April 3 update is but one of many planned patches for the game. Build #3703355 introduces a lot of tweaks and balances meant to keep the game balanced for all players. Be sure to stay on top of the latest changes by heading over to Shacknews' Risk of Rain 2 home page.